Apple’s new MacBook Pro series – regardless of screen size – ships with four connectors, all of them USB-C. That may lead to some confusion, because these aren’t the USB ports most people know from their current laptop. Lots of USB controllers, audio interfaces, etc. And I’m not an edge case; most people use USB stuff and the SD slot and a video output with some Thunderbolt things thrown in among audio users. Obviously, this also often requires a USB hub. 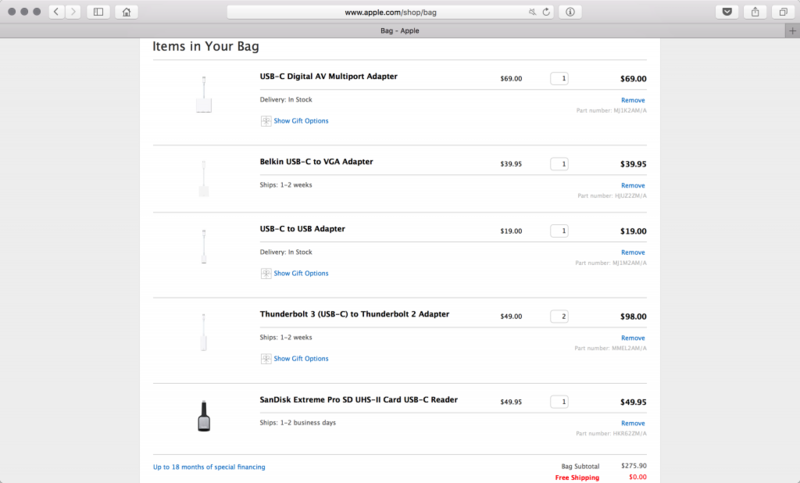 Now, swapping out the machine I own now for a hypothetical MacBook Pro with USB-C connectors and Thunderbolt 3 is not without advantages in the future. Both faster USB 3.1 and Thunderbolt 3 devices are supported. As I’ve reported before, Thunderbolt can offer more consistent performance at low latencies. Here’s the problem: adding more bandwidth won’t help you unless you can exploit it. Speaking for essentially all music and audio work currently, and most creative visual work, there’s nothing specifically that can take advantage of all this added bandwidth. So practically speaking, for musicians certainly and also most visually-minded people writing this site, you get a handful of advantages from USB-C and Thunderbolt 3. You can connect 4K+ monitors. You can provide more power via the bus. And you can charge your laptop via any one of the four ports. And a convenience: you don’t have to worry about inserting the connector upside down. You do have to worry about this smallish connection coming unplugged, though – which might also explain why Apple isn’t so concerned about having eliminated the MagSafe power connector (designed to pop out rather than let you trip and drag your Mac to the floor). Apart from the monitor, though, I don’t suspect anyone is actually going to notice any of that. And again, my existing laptop already has USB3 and Thunderbolt (2). I actually don’t want that last adapter – it’s wide and blocks one of the ports, and it has an extra USB and power passthrough I may not need. But there’s not yet a direct HDMI adapter. I’m going to skip adding a US$34.95 Ethernet adapter or a special $25-35 Lightning to USB-C cable – let’s presume I’ll survive without the former and just use a USB adapter for the latter. But stressing that this is all for existing hardware – meaning I get literally zero advantage out of this – the grand total is a whopping US$275.90. And being a bit less conservative and buying an extra charger, I could easily double that. Also, for y’all fellow Americans back home, I pretended for a moment I don’t live in Germany, where this would be yet worse (well, though with some money going to fund our trams and U-Bahn and so on). You’d need to figure this into the cost of a new MacBook Pro, as with the previous “new” MacBook. Likewise, you’ll presumably be able to buy non-Apple power adapters, since that USB-C port is standard. And notice you do get one advantage here: because of the added power delivered over the connector, you don’t need a separate power source. That’s a pretty big edge over USB for musicians. That said, there’s an underlying message here. Thunderbolt 3 looks great, if overkill for most users. But there’s a fairly hefty “Apple tax” for doing what you’re effectively already doing. And it raises two big problems. One, Apple is forcing you to use adapters, but the adapters they’re designing are clumsy, unoriginal, expensive, and take up space. There’s not even an attempt at a workable solution for people connecting more than one piece of hardware at a time. Obviously, they’re leaving that to third parties, but at the moment they don’t offer a complete range of connectors to match their previous generation themselves and don’t stock any third parties. Come on, Apple. All that innovation and you can’t make the dock this thing obviously needs? Two, I think the added cost would be easier to swallow if Apple’s machines were price competitive. But you’ll have to widen a margin that’s already significant. That could encourage Apple customers to either stick with what they’ve got or look to the Windows-based competition. And I do think many PC makers will simply offer a mix of legacy and new ports by comparison. Those sticking to Apple should find hardware is compatible. (We’ll have to wait on testing to know if there are any unexpected issues.) And I imagine they’ll be investing more heavily in third party accessories than Apple’s.